McGraw had eleven consecutive albums to debut at Number One on the Billboard albums charts; Twenty-one singles to hit number 1 on the Billboard Hot Country 100 chart; three singles named the #1 country song of the year; (It's Your Love, Just to see You smile, and Live Like You Were Dying) Won 3 Grammys, 14 Academy of Country Music awards, 11 Country Music Association (CMA) awards, 10 American Music Awards and 3 People's Choice Awards. Ranked as one of the top five in all genres of music, his Soul2Soul II tour with Faith Hill became the highest-grossing tour in country music history. McGraw has ventured into acting, with a supporting role in the Billy Bob Thornton film, friday night lights, a role in the kingdom, a lead role in 2006's flicka and a supporting role in four christmases with Vince Vaughn and Reese Witherspoon. He is also a minority owner of the Arena Football League's Nashville Kats. McGraw came to the attention of Curb Records in 1990. After cutting a demo single, McGraw gave a copy to his father, Tug McGraw. A man who was friends with Curb Records executives heard the demo while driving with Tug McGraw one day and recommended that Curb contact the young singer. Several weeks after he was able to play his tape for Curb executives, they signed him to a recording contract. Two years later, in 1992, he had his first minor hit Welcome to the Club off his self-titled debut album, Tim McGraw. Although the album failed to make much of a dent on the charts, McGraw did have two other minor hits from it in 1993, Memory Lane and Two Steppin Mind. All I Want, released in 1995, continued his run of success, debuting at number one on the country charts. The album sold over two million copies and reached the top 5 on the Billboard 200. I Like It, I Love It reached number one on the country charts as the leadoff single, while She Never Lets It Go to Her Heart also went to number one in 1996. Can't Be Really Gone, All I Want Is a Life, and Maybe We Should Just Sleep on It were all top 5 hits. In 1996, McGraw headlined the most successful country tour of the year, The Spontaneous Combustion Tour, with Faith Hill as his supporting act. Faith Hill broke off her engagement to her former producer Scott Hendricks so that she and Tim could start dating each other; then married on October 6, 1996. The couple have since had three daughters, Gracie Katherine (born May 1997), Maggie Elizabeth (born August 1998) and Audrey Caroline (born December 2001). McGraw's next album, 1997's Everywhere, again topped the country charts and reached number two on the album charts, selling 4 million copies. The first single, It&rsquo;s Your Love, a duet with Faith Hill, became the first single in twenty years to spend six weeks on top of Billboard's country singles chart (the previous such song had been Waylon Jennings and Willie Nelson's "Luckenbach, Texas (Back to the Basics of Love)" in 1977). The single reached #7 on the pop chart (and gained platinum status); and became the most played single in the history of the Billboard country charts. Five more singles Everywhere, Where the Green Grass Grows, One of These Days, For a Little While, and Just to see You smile reached the top of the country charts from the album, with the last of these setting a new record by spending 42 weeks on the Billboard charts. The Country Music Association awarded Everywhere its Album of the Year award for 1997. A Place in the Sun in 1999 continued McGraw's streak, debuting atop both the US pop and country album charts and selling three million albums. It featured another four chart topping singles on the country charts including Please Remember Me, Something Like That, My Best Friend, and My Next Thirty Years; Some Things Never Change reached #7 on the country chart. He also contributed a song for the Grammy-winning tribute album to Bob Wills, Ride With Bob. His song, a cover of Milk Cow Blues, was recorded as a duet with Asleep at the Wheel[/artost], whom he had met while performing together at the George Strait Country Music Festival. McGraw recorded two more duets with his wife in the late 1990s, both of which appeared on her albums. Just To Hear You Say That You Love Me off her multi-platinum 1998 album Faith, reached the top five of the US country charts, while her follow-up and 1999 album Breathe featured Let's Make Love, which would win a Grammy Award in 2000 for Best Country Vocal Collaboration. In 2000, McGraw released his Greatest Hits album which topped the charts for nine weeks and sold almost 6 million copies, making it one of the biggest selling albums in the modern country market. In the latter half of the year, he and Hill went out on the Soul2Soul Tour, playing to sellout crowds in 64 venues including Madison Square Garden. It was one of the top tours of any genre in the US and the leading country tour during 2000. While in Buffalo, McGraw and Kenny Chesney became involved in a scuffle with police officers after Chesney, who had permission from the sheriff's daughter, attempted to ride a police horse. McGraw came to Chesney's aid after police officers nearby believed the horse was being stolen and tried to arrest him. The two were arrested and charged with assault, but were later cleared. During a concert with the George Strait Country Music Festival several weeks later, Hill, dressed as a police officer, made an unscheduled appearance at the end of McGraw's set and led him off the stage. McGraw's next album, [album artist=tim mcgraw]Set This Circus Down, was released in April 2001 and spawned four number one country hits - Grown Men Don't Cry, Angry All the Time (with Faith Hill), The Cowboy in Me, and Unbroken. He also provided harmony vocals for the Jo Dee Messina song Bring On The Rain, which he also produced. The song topped the country charts. Hungry for more of his music, fans downloaded a version of his performance of the song Things Change from his appearance at the Country Music Association Awards Show. The song was played extensively on radio, becoming the first country song to appear on the charts from a fully downloaded version. In 2002, Tim McGraw bucked country music traditions by recording his album Tim McGraw and the Dancehall Doctors with his tour band The Dancehall Doctors. Unlike rock music, where it is commonplace for touring bands to provide the music on albums recorded by the artist they support, country albums are typically recorded with session musicians. McGraw chose to use his own touring band in order to recognize their part in his success and to capture some of the feel of a real band. * David Dunkley - Percussion. The album debuted at number 2 on the country albums charts, with the single Real Good Man reaching number one on the Hot Country Songs chart. She's My Kind of Rain reached number 2 in 2003 and Red Ragtop reached the top 5. The album also featured a cover version of an early Elton John 1970 classic Tiny Dancer, as well as appearances by Kim Carnes on Comfort Me - a response to the September 11, 2001 attacks - and Don Henley and Timothy B. Schmit of the Eagles on Illegal. 2004's Live Like You Were Dying continued McGraw's record of commercial success. The title track, dedicated to his father Tug McGraw who died of a brain tumor earlier in the year, was a soaring ode to living life fully and in the moment, while the second single Back When was a paean to an easy nostalgia. Live Like You Were Dying spent seven non-consecutive weeks at #1 on Billboard (10 weeks on Radio & Records) and went on to become the biggest hit single of the year. It also became one the most awarded songs/records by winning ACM Single and Song of the Year, CMA Single and Song of the Year and a Grammy. In late 2004, his unlikely duet with hip-hop artist Nelly on Over And Over, a soft ballad of lost love, became a crossover hit spending 10 weeks atop the Top 40 chart. This made Tim the first modern country artist to have two 10 week number one hits in a single year. "Over and Over" brought McGraw a success he had never previously experienced on contemporary hit radio, rap radio, and brought both artists success neither had previously experienced in the hot adult contemporary market. The song also spent a week at the top of the UK single charts, and was McGraw's first visit to the UK hit countdown. Throughout the 2005 NFL season McGraw sang an alternate version of I Like It, I Love It every week during the season. The alternate lyrics, which changed each week, would make reference to plays during Sunday's games and the song would be played alongside video highlights during halftime on Monday Night Football. Later in the year McGraw became a minority owner of the Arena Football League's Nashville Kats when majority owner Bud Adams (owner of the NFL's Tennessee Titans) was awarded the expansion franchise. It was dedicated to Tug McGraw.. In April 2006 McGraw and Hill began their 73-concert, 55 city, Soul2Soul II Tour 2006, again to strong commercial acceptance. The tour grossed nearly $89 million and sold almost 1.1 million tickets, making it the top grossing tour in the history of country music. It was named "Major Tour of the Year" by the prestigious Pollstar Magazine, beating out such heavyweights as Madonna and the Rolling Stones. In a special gesture, the couple donated all of the profits from their performance in New Orleans to Hurricane Katrina relief. Tim, along with Kenny Chesney, contributed to a version of Tracy Lawrence 's song Find Out Who Your Friends Are, which can be found on Lawrence's album For The Love. Although the official single version features only Lawrence's vocals, many stations have opted to play the version with McGraw and Chesney instead. 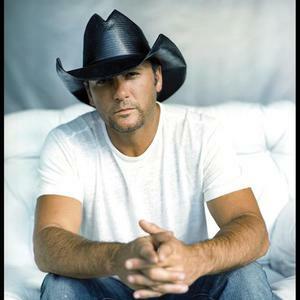 McGraw released his eleventh album, Let It Go, on March 27, 2007. The album's debut single, Last Dollar (Fly Away), reached No. 1 on the Hot Country Songs chart, marking Tim's first No. 1 single since Back When in late 2004. The album debuted at #1 on the Billboard Top 200 Album Chart and #1 on the Billboard Country Album chart, marking his 4th #1 top 200 album and 9th #1 country album. His daughters can be heard singing the chorus during the last few seconds of the song on the video. During the Academy of Country Music awards show on May 21, 2007, McGraw performed a song titled If You're Reading This, which he co-wrote with The Warren Brothers. Several radio stations began to play the live recording of the song; as a result, it entered the Hot Country Songs chart at #35. McGraw also produced the debut album of country music duo Halfway to Hazard. The duo's first single, Daisy, peaked at #39 on the country charts in Summer of 2007. In the summer of 2007 McGraw and Hill toured together once again in the Soul2Soul 2007 tour. In the January 18, 2008 edition of the USA Today newspaper, McGraw was featured on the Def Leppard album Songs From The Sparkle Lounge and has co-written the first single, Nine Lives, with Def Leppard band members Joe Elliott, Phil Collen and Rick Savage. The unusual pairing goes back to 2006 when McGraw joined Def Leppard onstage for the song Pour Some Sugar on Me. The album has a release date of May 6, 2008. In May 2008 he hit the road with the Live Your Voice Tour. The mainly outdoor arena concert tour will be his first solo outing in nearly three years. Also in May 2008, he debuted a new song off of his follow-up to Let It Go at the Stagecoach Music Festival in Indio, California. In July 2008, Tim McGraw's sixth single, and the title track of his album, Let It Go, was released to country radio. Following that, a seventh single, Nothin' To Die For, entered the Country charts at 57 late December. Tim McGraw released his third greatest hits package, Greatest Hits 3 on October 7, 2008. The album features 12 tracks. No new material was recorded for the compilation. A new album of all new material was scheduled for release in October, but has since been pushed back to 2009. The Better Than I Used To Be Songfacts states that after over 20 years with Curb Records and a legal battle, Tim McGraw finally left the label after a judge freed him from his contract. Curb immediately released Better Than I Used To Be as the second single from Emotional Traffic, an album that had been shelved for several months following the dispute. The Truck Yeah Songfacts reports that McGraw signed with Big Machine Records on May 21, 2012.